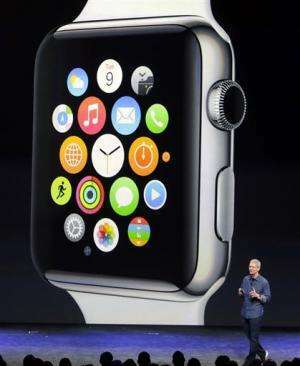 Apple unveiled its long-anticipated smartwatch Tuesday, introducing a device that aims to put many of the functions of a smartphone onto a smaller screen that's never more than an arm's length from the wearer's eyes. The Apple Watch, the company's first completely new product in four years and its first wearable device, is also Apple's most ambitious expansion since CEO Tim Cook replaced Steve Jobs three years ago. The watch made its debut alongside a service that seeks to turn Apple mobile devices into a payment system that will eliminate the need for consumers to bring cash or plastic cards to the checkout stand. Apple Inc. also used the occasion to present the next generation of its iPhone—two larger models that reflect the company's attempt to catch up with rivals that have been winning over fans with bigger screens that enhance videos and game playing. The bigger iPhones are expected to unleash pent-up demand among Apple zealots who have been pining for a larger screen, virtually assuring the new models will be a hot commodity this fall and through the crucial holiday shopping season. Although the iPhone figures to be Apple's main moneymaker for the foreseeable future, the new smartwatch was the marquee attraction of Tuesday's show. The Cupertino company held Tuesday's coming-out party in the same Silicon Valley auditorium where Jobs unveiled the Macintosh computer 30 years ago. Just as the Mac convinced more people to buy PCs for the first time, Apple is convinced that its new watch will become a must-have accessory for the masses after it goes on sale early next year. 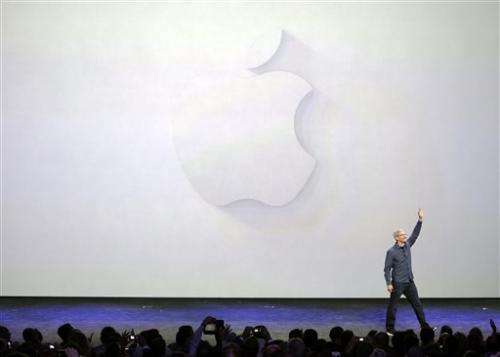 The device also may turn into a proxy for how well Apple is faring under Cook. 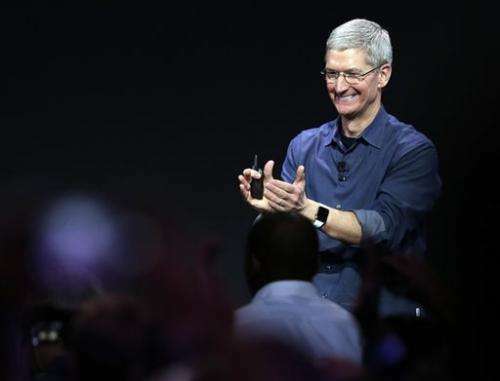 Apple has not entered a new market since Jobs died in October 2011, raising questions whether the company's innovative powers have been waning under Cook. Apple is a late arrival to the still-nascent market for wearable technology. Several other companies already sell smartwatches that have been greeted with widespread indifference. But Apple has a reputation for igniting dormant markets after the company shifted the direction of digital technology with the iPod, iPhone and iPad. Other MP3 music players, smartphones and tablet computers were first to market, but the devices didn't enthrall consumers until Apple imbued them with its magic touch. The iPhone 6 will feature a 4.7-inch screen, up from the 4-inch screen on the models released in each of the previous two years. The iPhone 6 Plus will boast a 5.5-inch screen and other improvements, including longer battery life, that will cost an additional $100. The screen resolution on the Plus version will be sharper than previous iPhones. With the larger screen comes a new horizontal view of the home screen. Usually, icons are stacked vertically, even when the phone is turned horizontally. App developers will also have new tools to rearrange their content to take advantage of that larger screen. The new phones are not as big as Samsung's latest flagship phones—5.1 inches for the Galaxy S5 and 5.7 inches for the Note 4—but they will be large enough to neutralize a key advantage Samsung and other Android manufacturers have had. Notably, Samsung's Note phone isn't getting bigger this year. Last year's Note 3 was 5.7 inches. Instead, Samsung is emphasizing other hardware features, such as a sharper screen. It's also releasing a model with a curved edge to display weather, time and other information on the side of the phone. 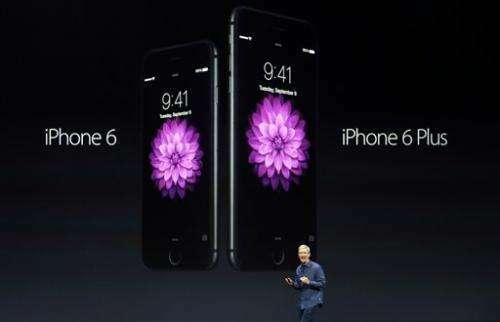 Apple says the new phones will be faster and have better battery life than previous versions. The phones will also have a barometer to estimate how much users climb stairs, not just how far they walk or run. Of course, some people still use their phones to make calls. So when there's poor cellular reception, iPhone owners will be able to make regular calls over Wi-Fi. The handoff between the two networks will be seamless. In the U.S., this feature will initially be available through T-Mobile. The resolution on the camera is staying at 8 megapixels, while rival Android and Windows phones have been offering up to twice that amount. However, the number of megapixels is only one factor in what makes a good photo. Apple says it is putting in new sensors for better shots. Apple is also improving a slow-motion video feature by allowing even slower shots. 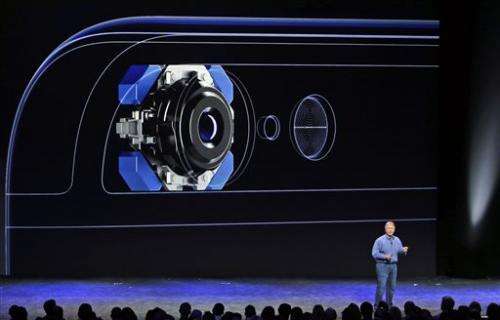 The camera will be able to take 240 frames per second, double what's in last year's iPhone 5s. Normally, video is at 60 frames per second. The new phones will start shipping in the U.S. on Sept. 19, with advance orders to begin this Friday. Starting prices will be comparable to those in the past—$199 with a two-year contract for the iPhone 6 with 16 gigabytes of storage. However, the step-up models will have double the memory as before—$299 for 64 gigabytes and $399 for 128 gigabytes. 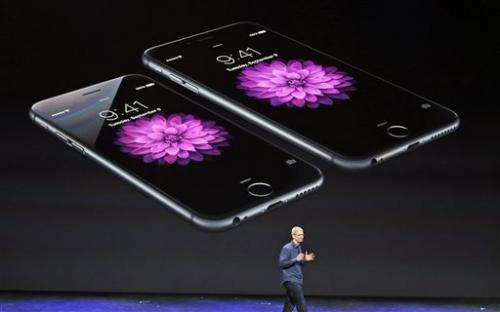 The iPhone 6 Plus phones will cost $100 more at each configuration. Apple is calling its new payment system Apple Pay. Consumers will be able to use their phone cameras to capture a photo of their cards. Apple will verify it behind the scenes and add it to the phone's Passbook account so people can make payments at a retailer. Apple announced several merchants that will accept this system, including Macy's, Whole Foods, Walgreens and Disney stores—and Apple stores, of course. Many companies have tried to push mobile payment services, but none has caught on widely. Cook says that's because the business models have been centered around companies' self-interest instead of the user experience. The latter, Cook says, is "exactly what Apple does best." For security, the card number is stored only on the device. Each time you pay, a one-time card number is created to make the transaction. The audience erupted with cheers as Cook proclaimed that he had "one more thing." It was how Jobs used to close his keynote addresses. That one more thing was named the Apple Watch, rather than the iWatch that many people had been speculating. 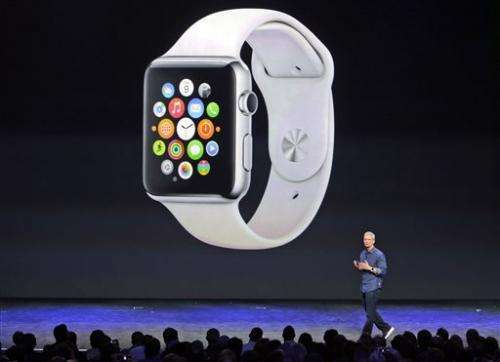 Cook says Apple had to invent a new interface for the watch because simply shrinking a phone would not work. 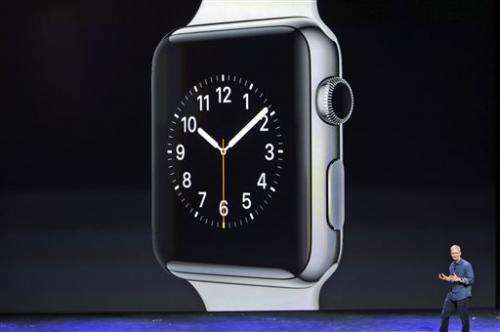 Much of the interaction will be through the dial on the watch, which Apple calls the digital crown. It's used to zoom in and out of a map, for instance. Apple also worked with app developers to create new functionality. Users will be able to unlock room doors at Starwood hotels or remind themselves where they parked cars with a BMW app. The new watch will come in a variety of styles and straps, with a choice of two sizes. Watches from competing vendors have been criticized for being too big for smaller wrists. 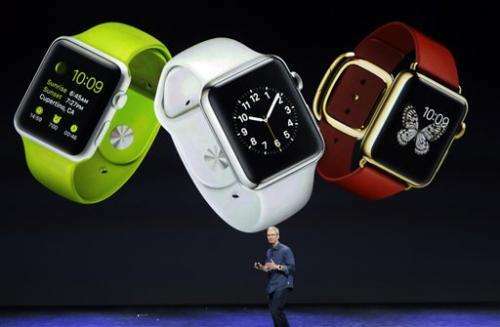 The watch will require one of the new iPhones or an iPhone 5, 5s or 5c. It will be available early next year at a starting price of $349. Though much of the attention has been on new gadgets, the software powering those gadgets is getting its annual refresh. Apple considers iOS 8 to be its biggest update since the introduction of the app store in 2008. Existing iPhone and iPad users will be eligible for the free upgrade, too. Among other things, iOS 8 will let devices work better in sync. For instance, it will be possible to start a message on an iPhone and finish it on an iPad. With an upcoming Mac upgrade called Yosemite, it will be possible to continue working on that same message on a Mac computer as well. These handoff features will extend to the new Apple Watch, too. The new software will be available to existing users on Sept. 17. Closing out the event, U2 performed on stage before Cook made its new album, "Songs of Innocence" available for free to all customers of Apple's iTunes. Apple's stock was up 1 percent to $99.36 in Tuesday's late afternoon trading. That is one fugly watch! And everything new on the phone is years old tech for Android users. Too much hype. Apple is not innovating, they are repackaging. I once had an Android moron bitching that the iPhone's battery cannot be removed and I wondered, why the fuss. That was until I saw him pop the back off his droid, remove the battery and count to 10, then put it back together. His brand new Android would constantly freeze and that was the only way to recover. Damn you Apple when will you make phones with removal batteries? WHAT?! You saw this you ...you....you...are so lucky! One of the guys at work would do the same thing and when it caught fire he was in fact driving in bumper to bumper traffic with his kid IN the car, buckled in the baby carrier and all. He dropped the phone on the floor from his inside jacket pocket, it ignited the car flooring, and since this was an old Vette, the firewall is NOT metal. Fortunately, the child lived....the car died...but the insurance company and the police JUST LAUGHED. Yep, seen id wid me own 2 eyes. Oh, I forgot to mention I laughed and LAUGHED. He probably was just changing out the SD card, which is another failure for the iphone. Open Source for the Win. They never really talk about the fact that everyone is involved in Android, that it's open to play with. Android is the Mobile equivilent of Windows, and Windows won. But it's like Firefox vs Chrome, they each have strong and weak points. However, nothing here is new, it's yawn after yawn of struggle street. They will probably make more money from Apple Pay, than all device sales. That must surely upset Google.